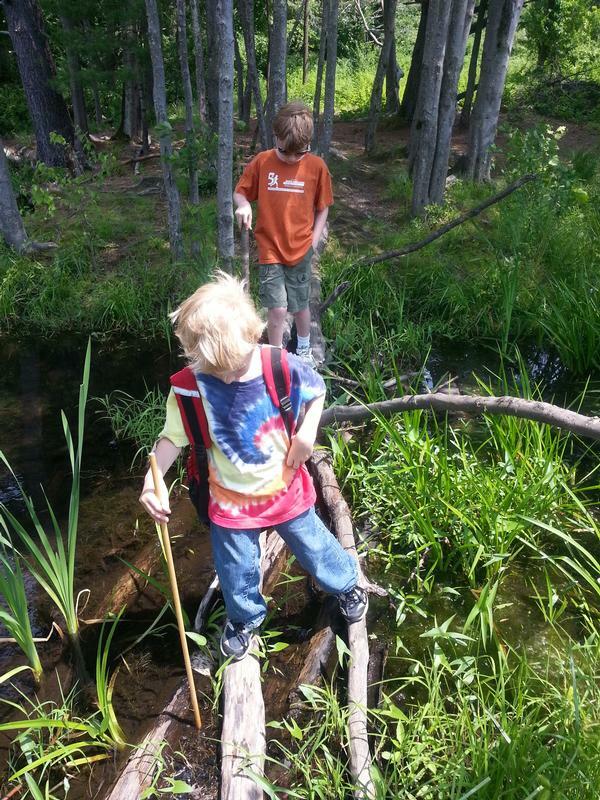 Stream crossings, a natural spring, and dogs splashing in ponds: if there were a checklist for elements that would make a family hike memorable, these would be near the top for my kids. When we visited the Bower Springs Conservation Area in Bolton, MA, we found new joys at every bend in the trail, and by the time we headed home, our bar for hiking experiences was set to a new high. In planning this trip, I was taking into account three key things: heat, humidity, and my youngest, Teddy, joining Owen and I (Will was off on adventures of his own for the day). I decided to go for a spot rated easy and short that also offered the guaranteed magic ingredient for kid success: water. When I searched online for a trip matching these key features, Bower Springs rose to the top. After parking at the trailhead at the end of Bolton's Flanagan Road, we had a short walk down a wide, easy, tree-lined path to the spring on our right. 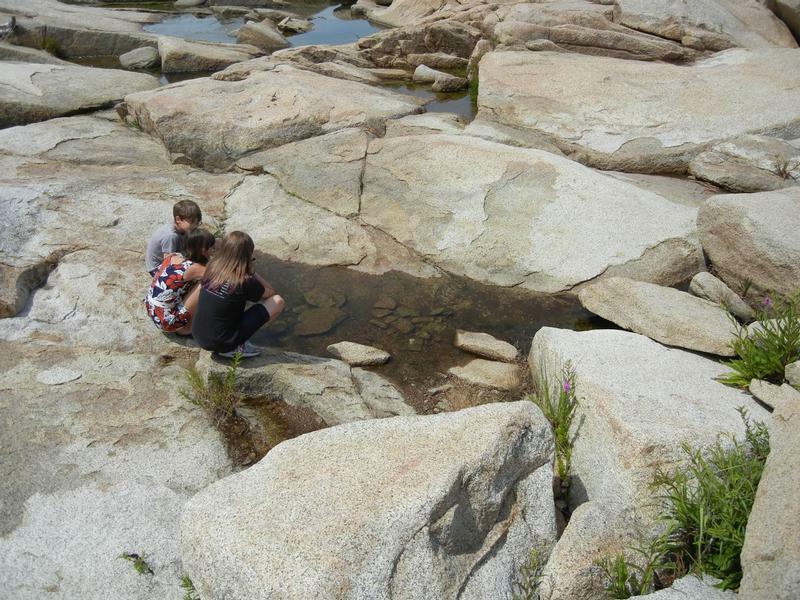 We were all excited at the shared moment of seeing our first natural spring and took turns dipping our hands into the icy water to cool off. From the spring, we meandered along next to the pond and stopped frequently to watch froglets moving around under the calm, clear water, as well as a host of dragonflies and damselflies in a rainbow of colors. A little farther on, we found we could take our pick between the still pond on our right and a ripply, larger one on our left. 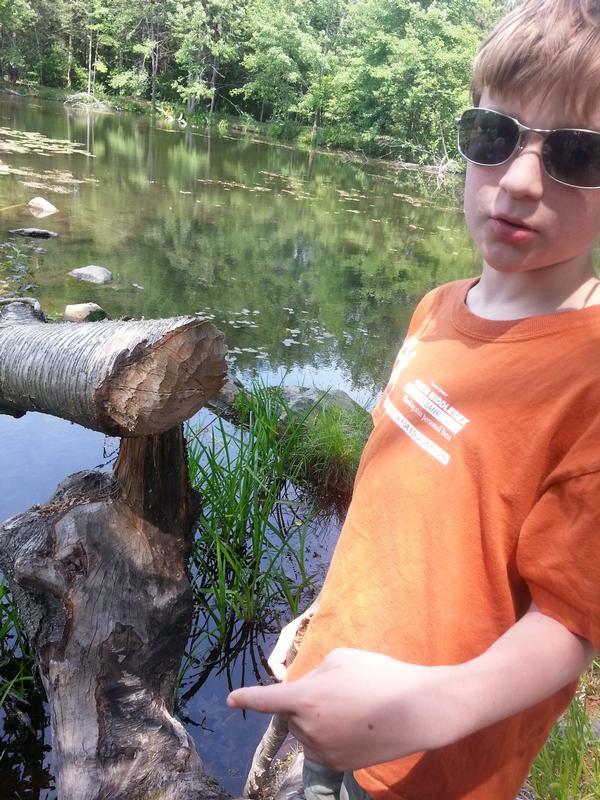 Choosing to explore the latter, we spotted a big rock out in the water that Teddy and Owen ventured out to on two sets of logs placed there for this purpose (walking sticks were instrumental). The thrill of negotiating both of these bridges and scrambling up onto the rock island instantly catapulted this hike to “epic” status! After basking in their success for a few minutes, we came back to terra firma to continue. We opted to take one side spur into the woods a short distance and found a small stream with another couple of log crossings: one that was more or less a pile of sticks, and the other a large downed tree. The boys spent some time going back and forth across both, just having fun with living slightly dangerously (though at worst, they would have had wet shoes or a slight bruise if they had fallen). We rejoined our loop around the larger pond and, after checking out some signs of beaver activity, found a brief shoreline where we spent some time wading (in water far warmer than by the spring), watching small schools of fish and checking out interesting rocks. Another spur led to a view of a solemnly quiet section of dead trees ringed by live ones. The perfect cap to the hike for both boys was stopping to talk to a fellow hiker throwing a frisbee for his two fun-loving Border Collies (unfortunately, my camera battery was toast by then). He let the boys try a few throws and did his best to keep Owen and Teddy from getting a soaking-by-shakeoff. Dog-friendliness is a key feature of this area: besides offering doggy (but it should be noted, not human) swimming, the area is liberally sprinkled with clearings where dogs can run at will, and waste bags are available at the trailhead. All told, we covered no more than 1.5 miles, a distance perfect by Teddy standards (though the trails easily offer longer hiking options), and the terrain was varied but all easy, as promised. It's a bellwether of the day's success that, on our drive home, both of my gamers-who-love-their-air-conditioning wanted to know if we could do more hiking this summer. Can't ask for a better review than that! Thanks to easy trails, I would recommend this hike for kids of all ages (I think we even saw one or two families with strollers, though you'll want good, sturdy tires for the trails). Plan your own trip using the information available from the Town of Bolton. My two-cent's worth: the map on the site is fairly basic without much detail on the different trail segments, but the trails are quite easy to find and follow. 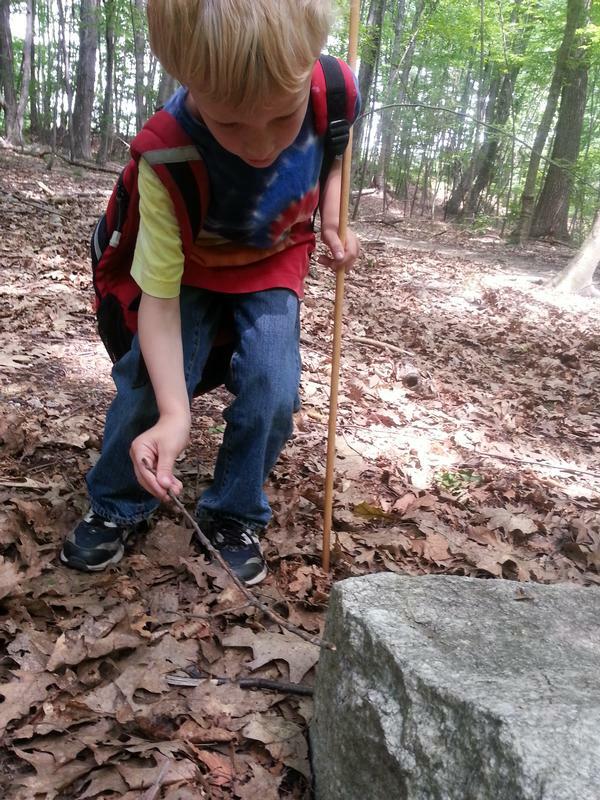 And if your children enjoy geocaching, a cache is said to be somewhere on the property. About the blogger: Melissa Macdonald is a featured guest blogger as part of AMC’s Kids Outdoors Boston Parent Ambassador program, which partners with local parents to share their outdoor experiences with this online community and beyond. 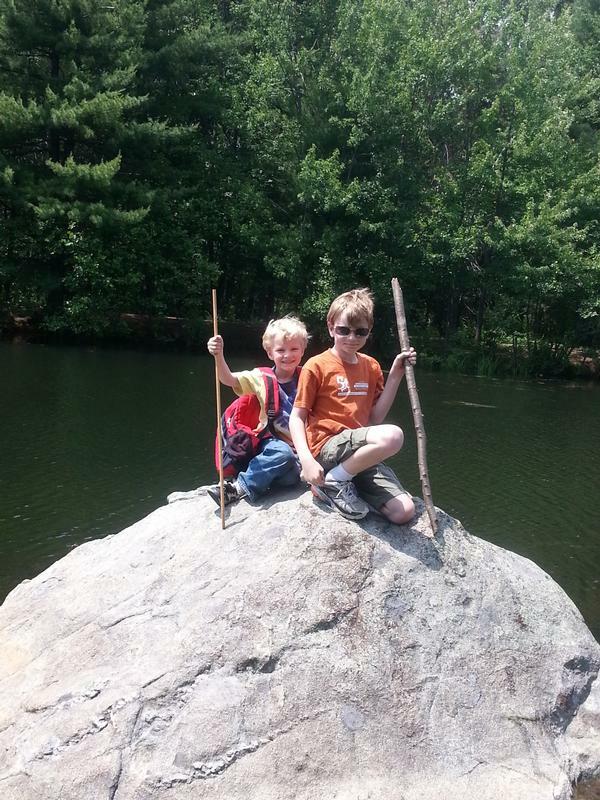 Melissa lives west of Boston and enjoys exploring outdoors with her three boys: twin 10-year-olds and a six-year-old. 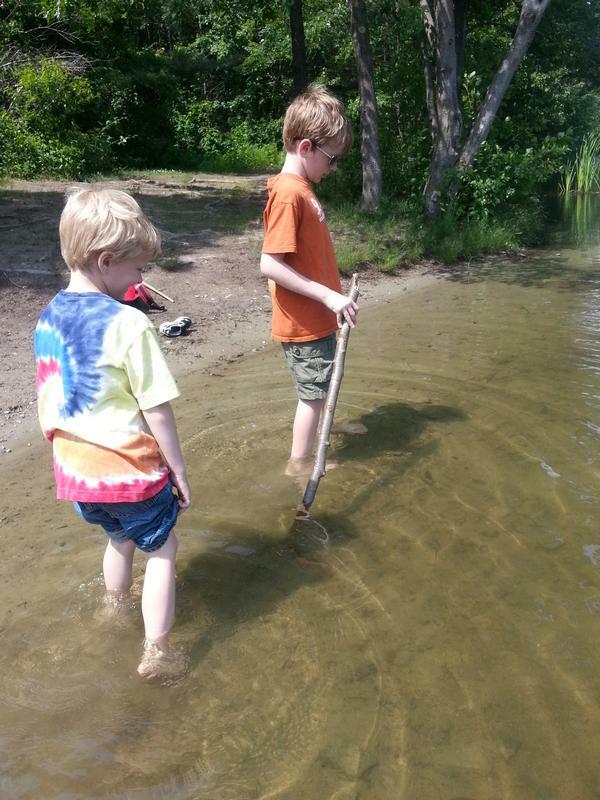 Stay tuned throughout the summer for monthly blog posts and trip reports from Melissa, as well as from other local Parent Ambassadors and AMC’s Outdoors with Kids Boston author, Kim Foley MacKinnon.